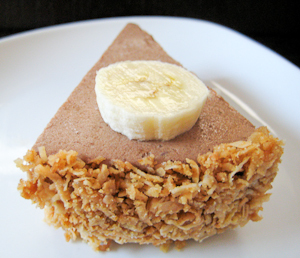 This week's Tuesdays with Dorie (TWD) recipe was chosen by Spike of Spike Bakes: Banana Coconut Ice Cream Pie. When I was a kid, I loved going to Disneyland. We only lived 30 minutes from "the happiest place on earth," so I was lucky enough to get to go there at least once a year. Sure, I loved meeting the Disney characters, seeing the castle, and going on all the rides... but what did I really look forward to the most? The food :) I'm sure that if you're regular visitor to my blog, that can't really surprise you. I'd love grabbing a churro and eating it while waiting in line for Splash Mountain. Or drinking one of those slushy lemonade drinks while waiting to board Star Tours. But my absolute favorite thing to get at Disneyland? Their frozen bananas! A banana dipped in chocolate, then rolled in peanuts and frozen to perfection! Yum! Imagine my delight, then, when Rocky Mountain Chocolate Factory came about and started offering frozen bananas in their stores! I was thrilled that I no longer had to be at an amusement park to enjoy one of my favorite frozen treats. I've even gone and made my own frozen bananas at home a few times, but I always feel so wasteful dipping anything in chocolate because you always end up with some excess in the bowl. So, when Spike chose the Banana Coconut Ice Cream Pie, I was eager to make it. Just reading the recipe immediately took me back to my childhood memories of frozen bananas! 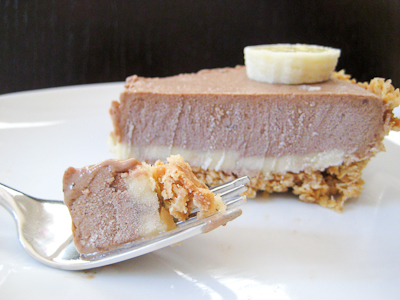 It's a layer of chocolate banana ice cream atop a coconut crust, sandwiched between two layers of sliced bananas (although I layered lots of banana slices on top of my pie, for the blog photos I only added a single banana to the slice I photographed). 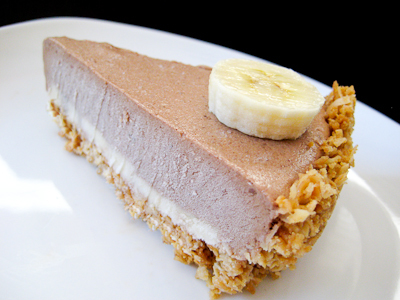 While I adore the flavors of chocolate and bananas together, I have to agree with my husband in saying that the crust is the star of this recipe! Unfortunately, I couldn't find the LU shortbread cookies that Dorie recommends so I used graham cracker crumbs instead. Still, butter + browned coconut + cookie crumbs = one amazing crust! I didn't have a deep dish pie plate, so I used a springform pan instead and didn't have any problems. I loved this pie and since making it this weekend I have eaten half of it all by myself! :) It totally reminds me of my childhood frozen banana favorite, only it's kicked up a notch with an amazing buttery coconut crust. - If you do not have shortbread cookies, you can substitute graham cracker crumbs. Put the chocolate in a 2-quart liquid measuring cup or a large heatproof bowl. Bring ¾ cup of the cream to a boil. Pour the cream over the chocolate and let it sit for a minute, then, using a rubber spatula and starting in the center of the mixture, slowly stir the cream in to the chocolate in ever-widening concentric circles. When the ganache is smooth, set it aside. Meanwhile, in a medium bowl, whisk the yolks and sugar together until well blended and just slightly thickened. Still whisking, drizzle in about one third of the hot liquid- this will temper, or warm, the yolks so they won’t curdle. Whisking all the while, slowly pour in the remaining liquid. Pour the custard back into the pan and cook over medium heat, stirring without stopping, until the custard thickens slightly and coats the back of a spoon; of you run your finger down the bowl of the spoon, the custard should not run into the track. The custard should reach at least 170 degrees F, but no more than 180 degrees F, on an instant-read thermometer. Immediately remove the pan from the heat and slowly and gently stir the custard into the ganache. i also subbed graham crackers, and loved the crust! Your photos are great! I really want to make that crust someday. (I made ice cream sammies with Dorie's Coconut Butter Thins). I've made her ganache ice cream before--it's DANG good! I love frozen chocolate bananas, too. Looks to good to eat. sorry, i got distracted. :) your pie looks perfect, jaime, and while i'm sure it's tasty, i'm easily convinced that the crust would be the best part. wow, that looks great! I too love frozen bananas dipped in chocolate- thanks for making this with me! Your pie is gorgeous Jaime! This one was a huge hit at my house too :) I am so jealous that you lived so close to Disneyland as a kid. I didn't even visit Disney for the first time until I was almost 20!